Anchor Pressure Washing offers quality garage cleaning services to all its customers. This company understands the value of keeping a parking garage cleaned and sanitized to enhance the appearance of the community in which it operates and to provide customers the satisfaction of entering a structure that is well maintained. Anchor Pressure Washing understands these values and will work diligently to offer the most professional garage cleaning service. No one wants to walk into a parking garage filled with oil stains, urine, broken glass, rotting food, and debris. If customers are confronted with these unwelcomed elements, they are not likely to return to a business. Furthermore, many of these customers will complain to family and friends. Some will write bad reviews and even report the business to the appropriate government agencies. These unhappy customers can ruin a business. Anchor Pressure Washing wants to prevent customers from being unhappy by using top of the line equipment and qualified employees to properly clean parking garages. Anchor Pressure Washing is not only concerned about the cleanliness of a parking garage, they are also concerned about the environment. Oil, urine and other toxins left in a garage for a long period of time affect the environment and must be properly cleaned. Using cleaning products that disinfect the surface of the garage will help protect the community’s environment and the earth overall. Anchor Pressure Washing also understands that all customers and employees must be safe when using a parking garage. The garage must be void of any particles that will cause people to slip and fall. These experiences can lead to customers getting hurt. Also, they can lead to lawsuits which can cost business owners a great deal of money. Anchor Pressure Washing will put their customers at ease by making sure garages are safe. If you are a business owner, chances are you take pride in your work and want each customer to feel at home. Part of maintaining your business lies in taking pride in the appearance of your building and making sure your customers are greeted by an aesthetically pleasing environment. A clean exterior tells potential and current customers that you are responsible and savvy and that’s why Anchor Pressure Washing offers top-quality building cleaning services to the Nashville, TN area. We do parking lots, sidewalks, stairwells and building exteriors. We can remove stains from gum, grease and other grime. We can even clean up those filthy dumpster areas. Our state-of-the-art equipment will make any building look cleaner and more welcoming. Don’t let foot traffic, the elements or mold ruin your reputation; show your customers that you mean business when it comes to the maintenance of your building. Call Anchor Pressure Washing today to get answers to your questions or set up an appointment! Most of the time, the roof of a commercial building is invisible to the customer’s eyes. Regardless, keeping your building in optimal order means having it regularly cleaned. Obviously, if you hire someone to come and clean it, they will notice if it is time for any repairs. As we all know, catching a problem before it grows larger will save you a significant amount of money in the long term. Listed below, some of the long-term costs you can avoid by having your roof cleaned are detailed in order to make this decision for yourself. When you own a commercial property, it is likely that your employees are dependent on having a clean environment to work in. However, if they are battling black mold issues because your roof is covered in moss and fungus, this will affect your business revenues. In addition to creating under-productive work staff, you can also see the costly results of a dirty roof in your employee health care plan. Have you seen the insides of your gutters lately? Most commercial property owners forget all about the cleanliness of their gutters until there is a problem. More often than not, long-term problems related to gutters involve the foundation. When water is pouring from the roof, this means water is collecting in areas that can lead to expensive foundation issues later. Dirty gutters that do little to control the flow of rainwater may also cause problems for customers and employees by creating mud or ice patches. Using a pressure washer on concrete is a totally different concept than using the same equipment on a roof. Even if you adjust the flow properly, you can still end up forcing water under the roofing materials and causing irreparable damage to your commercial property. In order to avoid mishaps like this, one call to a local roofing contractor that specializes in cleaning is all you need to avoid extra expenses. Clients are inclined to make assumptions about the success of a business based on first impressions. Just as businesses rely on strong contact with clients over the phone, they should also rely on the first things customers will see. The senses are the only thing a client has to initially determine if he or she should conduct business with you. Make sure the entire experience is a pleasant one by making sure the parking lot is clean. A parking lot gathers trash quickly as passersby and clientele do not want to search for a proper receptacle to place it in. Pot holes and loose pavement give the entire business a rundown appearance. Overflowing trash receptacles and ashtrays are an eyesore that could chase business away. Rancid odors from nearby dumpsters are a surefire way to send clients running for the hills. That is why it is important to make sure the parking lot is as clean as the office areas are kept. Pressure washing the building and parking lot will give it an even cleaner appearance. Anchor Pressure washing will help make old surfaces look brand new. The first visual that a client sees about a business can make or break the business connection. Keep the parking lot in good repair. Have trash receptacles checked every hour to assure there is no overflow of cigarette butts and/or trash. Every step a business takes towards keeping the parking lot area clean is a step towards strong repeat business. If the parking lot screams trashy when a client drives in, it will not matter how classy the inside is. A clean parking garage makes a good first impression on customers and guests. With age, however, the parking garage becomes dingy, oil-stained and littered with gum and other hard to remove stains. Oil also poses the threat of becoming extremely slippery when mixed with water that always comes with rain and melting snow. Oil and water create hazardous conditions in parking garages, especially for cars traveling down the ramps. There is also the hazard for pedestrians walking to and from their cars. A slip and a fall on concrete can be devastating to a person and possibly lead to some expensive litigation. Keeping a clean garage not only looks good for the business that owns it, but it is also much safer to drive and walk on. Customers really do take notice of these details and appreciate a good clean surface to walk and drive on. Anchor Pressure Washing offers a cleaning service for the concrete surfaces of parking garages. Their team of professionals can clean an area thoroughly without leaving wand marks or swirls on the surface. Their soft wash method can be used to clean an area that may be easily damaged with pressure. Anchor Pressure Washing has been in the business since 1996. They’ve taken on some of the toughest assignments and left their customers with surfaces that looked like new. Their techniques will work for your surfaces also, no matter how thick the build-up. Give them a call for a free estimate. TPO roofing, which stands for thermoplastic polyolefin roofing, is a type of roofing material introduced to the United States in 1989. Originally used in automobile interiors, it comes in white, light gray or black. Available in a variety of thicknesses, it can be installed as a new roof or simply laid down over an old one. Resistant to tears and punctures, it’s one major advantage is it moves with the building, making it very popular in windy climates. Lasting 10-20 years, TPO roofing that’s light in color is very good at reflecting light, helping a building cut down on energy costs. Popular in southern states, it can save as much as $250,000 over ten years when installed on warm weather buildings. One of the biggest concerns when using this type of roofing is keeping it clean as it ages. As the material ages, it becomes weak due to sun damage and eventually cracks. The best way to avoid this problem is to use a lighter color, particularly white, and clean it on a regular basis using pressure washing. When it comes to power washing, Anchor Power Washing can help with keeping the roof clean. While TPO roofing is generally resistant to algae and mold buildup, it nevertheless needs to be cleaned regularly to make sure this buildup doesn’t happen. Anchor Power Washing, serving Nashville and surrounding areas, has years of experience using soft washing techniques that keep the roof clean and free of algae and mold buildup. Are Your Sidewalks Ready For Summer Shoppers? Along with the summer season comes tourists and area visitors who enjoy window shopping throughout the neighborhood. Visitors look for areas to shop which appear clean and offer a variety of stores that are easily accessible by sidewalk. Clean sidewalks and walkways throughout neighborhoods and shopping centers not only attract potential customers, but will keep the area looking in tip-top condition throughout the entire season. Take advantage of these helpful tips to get your sidewalks ready for the summer shoppers that are coming your way. To obtain the cleanest sidewalks and walkways possible, you will first want to remove all trash and debris from the pathways. This should be maintained on a regular, everyday basis. Next, you are able to take advantage of commercial pressure washing services that will clean the dirt, dust and grime off of your sidewalks for the best look possible. For companies and individuals in the Nashville, Tennessee area, consider using Anchor Pressure Washing, a leader in the industry, as your top choice for pressure washing needs. Commercial pressure washing services from Anchor Pressure Washing use top of the line pressure washers with enough PSI to clean all stains and marks that are visible on your walkways. This powerful stream will tackle all of your problems while using the best cleaning power possible. In addition, by using less water than a typical garden hose, Anchor Pressure Washing’s high end machines can complete heavy duty jobs without the waste of water. Shoppers are sure to be impressed by your clean sidewalks after the job is complete. The warm weather has arrived and that means it’s time to wash your roof. You might have noticed some dark green or black streaks on your roof’s shingles. Those dark streaks indicate mold and fungus growth. Anchor Pressure Washing can remove those unsightly stains quickly and have your roof looking beautiful once more. Did you know that having mold on your roof can increase cooling costs? Mold, algae and fungus absorb more heat from the summer sun. They also make it harder for heat to dissipate, and make your cooling units work harder and longer. This alone can add a substantial amount to your monthly bill. Are you thinking of selling your home? Be aware that first impressions go a long way. Potential buyers will be turned off as soon as they pull up and see dark streaks of mold on your roof. They will also turn away when they see how much it costs to keep your home cool. This is another reason you should have your roof cleaned on a regular basis. Anchor Pressure Washing services both residential and commercial accounts. We use soft washing techniques that will not damage roofing material. Our technicians are experienced professionals who can answer any questions you may have. We do a thorough cleaning that will improve both the appearance and longevity of your roof. Everyone wants to save money. One way to do that is to lower your monthly bills. Control your cooling costs by hiring Anchor Pressure Washing today. Are you interested in refreshing the entire look of your home without spending a fortune? Perhaps you are about to list your home for sale and understand how important first impressions are. Maybe you’re just ready for it to look like it did years ago when you had it first painted or vinyl-sided. Whatever the reason, having your home professionally power washed by Anchor Pressure Washing is a good idea. While the beautiful Nashville weather is something that many residents enjoy, the humidity that is often presents encourages the growth of mold and mildew on a home’s surface. This mold can discolor and, if left untreated, cause damage to visible as well as unseen areas of your home. Mold can cause health risks in individuals with compromised immune systems. Even healthy people can experience respiratory illness due to inhaling mold spores. We treat every home as if it were our own. We use only a specially formulated house wash to remove mold, mildew and dirt. Gentle pressure washing techniques are used by all of our technicians so homeowners never have to worry about any damage being done. At Anchor Pressure Washing, we have almost 15 years of experience in all aspects of home and commercial pressure washing. We regularly make homes, buildings, decks, concrete, and driveways look new. Our technicians are trained in the latest techniques and we offer a 100 percent satisfaction guarantee. Over time, your home’s beautiful exterior appearance could be stained by mildew and other environmental contaminants. If the exterior is not properly washed on a routine basis, the unattractive residue will eventually become an eyesore that decreases the value of the home. No home owner wants to purposely diminish the curb appeal of their house. A viable solution is to have your home professionally washed. However, it is important to note that not all home washing services are created the same. If you choose an inexperienced or sub-par service, you risk damaging the exterior of your home. You need to choose a company that has highly-trained individuals that are qualified to get the job done without any hiccups. Experienced washers are skillful at pressure washing a variety of different materials. They know how to adjust the level of pressure to fit the specific type of surface. You should not have to subject your home to a destructive washing process that could lead to expensive repairs. Choosing an experienced and reputable service like Anchor Pressure washing is a wise decision. 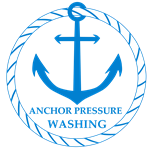 If you have any questions or concerns, feel free to contact Anchor Pressure Washing.